I invite you to check the Top 50 branded pages (in terms of number of likes) and in particular the growth rate and level of engagement enjoyed by those popular brands. There is still not a single financial institution in this exclusive club, but American Express is catching up. If in your quest for social media greatness, you are aiming to emulate the social media strategy of the most ‘engaging’ and ‘successful’ brands online, you will like this post. As part of our Visible Banking Facebook Watch series, we now track and benchmark over 1,400 facebook pages and apps in 78 countries. Even though I would argue that social media is a different ball game in marketing and it is more important to identify the best practices from the worldwide financial services industry than other more fashionable industries like retail, luxury or media, my team also monitor the progress of the global Top 100 brand pages. You will find below the Top 50 ‘most liked’ brands on facebook. Please note that as a basis, months ago we used the Top 100 brand pages as listed on the excellent socialbakers.com. There is no financial brands in the Top 50, so what? Don’t tell me it comes as a surprise, really? First of all, it wouldn’t be fair to compare such a regulated industry like financial services against FMCG or Media. * build clever partnerships with the likes of Zynga like Farmers Insurance or Capital One (2.4 million likes, 4th on our list). But then comes the challenge of brand intimacy and relevance. It will also surely make it harder to come up with the right content strategy: how hard will it be to appeal to the majority of your facebook ‘community’? Is it even possible? Does your audience even want to hear about financial products at all? So instead of focusing on size, let’s have a look at the growth and the relative level of engagement. 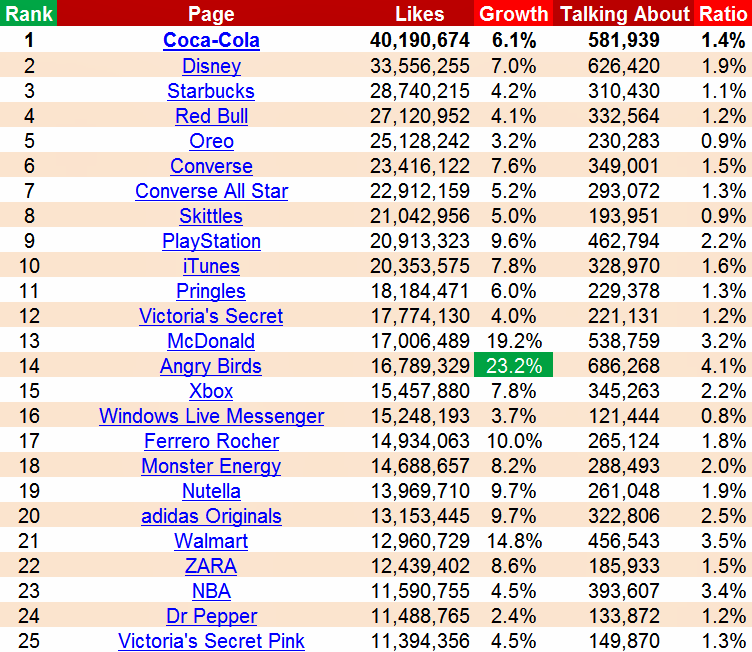 In February 2012, the Top 50 brand pages added a whopping 48,385,5342 likes which corresponds to a growth rate of 7.44%. The average level of engagement (ratio ‘talking about this’ / ‘likes’) is 1.9%. As far as the Top 50 financial brand pages are concerned, the average level of engagement is 2.95%. Please note that from the end of the month, we will add at least two new stats (available in the new timeline for page format): monthly ‘People Who Like This’ and ‘People Talking About This’ (which will replace the generic ‘Talking About This’. I would love to hear your thoughts on this topic. So, how do you measure success on facebook? What are your key KPIs?